Total Compensation Solutions is pleased to announce the publication of the 5th edition of our study on Executive and Professional Positions in the insurance industry. This study includes data from 464 insurance companies on 58 job titles ranging from CEO to Claims Assistant in P & C, Workers Compensation and Professional Liability. 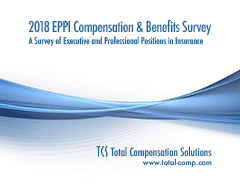 Total Compensation Solutions (TCS) started our partnership with the insurance industry in 1987 and 1989 with the launch of two comprehensive surveys for independent trade associations representing insurance companies. Since then, we have completed studies for property and casualty; professional liability, workers’ compensation, special risk, and health insurance companies. Our surveys compare compensation practices among similarly sized and structured insurance companies. We provide organization charts for reference; actual base salary; target and actual incentive payouts; and other information relevant to compensating executives, middle managers, and professionals in the insurance industry. We know that there are numerous choices for insurance industry compensation surveys. TCS has worked with insurance industry groups for over 25 years and our surveys are consistently ranked an “outstanding benefit of membership” by trade association members.